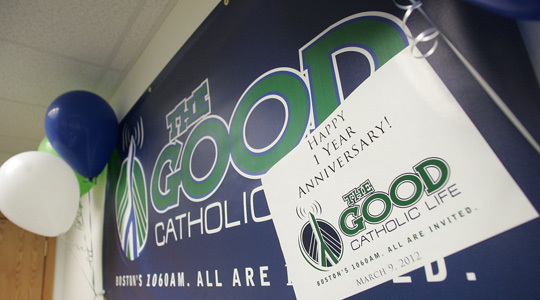 Summary of today’s show: The Good Catholic Life is one year old! Scot Landry, Fr. Matt Williams, Susan Abbott, Fr. Chip Hines, and Fr. Mark O’Connell talk about their favorite shows and guests and how the show has affected them and their ministries. Also stories of how the show has affected others they’ve talked to. 1st segment: Scot welcomed listeners to our one-year anniversary show. We’ll be looking back at some of our favorite shows with our co-hosts, Fr. Matt Williams, Susan Abbott, Fr. Chip Hines, and Fr. Mark O’Connell. Fr. Chris O’Connor is traveling right now. Susan said when Scot asked her to be a co-host, she thought she just wouldn’t have the time to take away from her work, but the Lord and her immediate supervisor, Janet Benestad, made it clear she should do it. She had been on CatholicTV a number of times and knew what that was like and had had no idea what it would be like to be on radio, but it turns out is been great fun. Fr. Matt Williams said he remembers discerning a year ago whether to do the show. For the first month, he was nervous before each show, but now it’s a normal part of his day. He’s developed his own style. Susan said Scot told her that Thursday would be the easiest show because it was just the news, but it turns out that the packets are up to 39 pages of articles from The Pilot and The Anchor. Scot said he gives them at least an hour to prepare for the show. Fr. Mark O’Connell is on the phone. He said his discernment didn’t take long. He knew his parents would love to hear their son the priest on the radio. He said they are the show’s biggest fans. He said his biggest surprise is that he hasn’t been fired from the show. He was apprehensive at first, but really enjoys it. He especially loves when they interview his brother priests and their weekly look at the Sunday readings. Scot said we have tried to invite a lot of our priests on the show and it seems they are most often available on Fridays. Scot said two of his favorite shows included the moving witness of Fr. John Sheridan in leading a parish through the abuse scandal and Reconfiguration. Then Msgr. Frank Strahan is a legend among the priests of the archdiocese. Fr. Mark said he also loved to see the amazing variety of ministries in the Archdiocese of Boston. It is astounding to see the variety here. Scot said Fr. Chip Hines had previous broadcast experience with CatholicTV’s Spotlight show. He said TV is uncomfortable because the camera captures everything. He does enjoy coming into help out. Scot said Fr. Chip has filled in quite often at the last minute. Fr. Chip said it’s fun to come up with something impromptu. They recalled a show when there were some technical difficulties and after reading a document, Scot turned to Fr. Mark and asked him what he thought. Fr. Mark fumbled for a second, and admitted he wasn’t paying attention. Scot said our Wednesday shows have taken place a few times in other locations, including Madrid and Washington, DC. Fr. Matt said it’s been fun to be on the road during times where he’s been working in youth and young adult ministry. He recalled the great interview from the March for Life with Cardinal Sean and Sister Olga. Most especially when you can get the young people on in their witness. Scot said one of his favorite shows was Cardinal Spellman High School in Brockton during Catholic Schools Week. He was almost speechless at their technology program and at their campus ministry, including an amazing Mass that has a waiting list of priests who want to celebrate it. Fr. Matt said the Mass is very lively and the Holy Spirit is strong there. Scot said unlike Fr. Matt, Susan sees the same group every Thursday pretty much to discuss the news, including Fr. Roger Landry and Gregory Tracy. Susan said of the shows she’s participated in, the favorite was the Holy Thursday show last year, looking at Holy Week and the Holy Father’s Stations of the Cross. She also loved being on the show with the Sisters of Notre Dame. Scot said one of the things he’s picked up on the Thursday shows was getting current on Catholic news every week, not just in the local Church, but nationally and internationally, including some of the documents in the news. Susan said as much work as it is, it really is an impetus to read. She can’t not read through her weekly packet. She did note how many wonderful positive stories, including local baker Andy LaVallee and last October’s series in the Pilot on Project Rachel. Certainly we need to be aware of what we need to act on, but also what’s happening that’s wonderful and lifts us up. Scot said it also has helped to appreciate the amount of content in our Catholic newspaper. He also said he’s also proud of being able to bring clarity to issues that have had erroneous information in the public or in the media. He recalled interviewing Msgr. William Fay on Pastoral Planning to clear up some misconceptions in the Boston Globe. He said recently he and Fr. Chip were able to talk about his practical experiences as a pastor leading two parishes to show the challenges he’s been facing. One of the best aspects of the show for Fr. Chip is being able to give that perspective. Fr. Chip talked about how pastoral planning has been such a positive experience. Scot said on Tuesdays and Wednesdays they often get to go in depth in some papal documents and he’s glad to be able to share that content with people in their daily lives. Fr. Matt said in the past couple of months they’ve been able to dive into a couple of the Holy Father’s letters and documents which are so rich. one of the most influential was the World Day of Communications message in which the Holy Father talked about Twitter that was the encouragement he needed to get going with it. 2nd segment: Scot said one of the first things he thinks of for our first year is the generosity of Jim and Joanne Wright who brought the Station of the Cross network into Boston and gave us this great time slot on WQOM. Rick talked about the great people in Buffalo that he works with regularly. Scot said there have been 276 guests on the 254 shows, 76 priests and bishops, 20 religious, 10 deacons, and 168 laypersons. We have profiled exactly 100 ministries, including 41 of the 50 or so ministries here in the Pastoral Center so it’s been a broad presentation of the Catholic faith. Fr. Chip said one of his favorite shows was when Lino Rulli was on and it was one of the funniest shows we’ve ever had. Scot said Lino is one of the funniest people in America. He’s a pioneer in Catholic radio. Fr. Chip said it was a giggle fest on the show. Scot said there’s so much good going on in the Archdiocese and we don’t have enough vehicles to get the good news on. Susan said religious education wasn’t one of the 100 so she would like to get them on soon. One of her favorite shows was when it was broadcast from Madrid. Scot asked her how often she gets to listen to the show and he favorite co-hosts. She said she listens to the recorded broadcast on her computer several times per week and of course, Fr. Chip and Fr. Matt are her favorites (who are the ones in the studio with her.) One of her favorite shows was the interview with Rocco Palmo, the blogger at Whispers in the Loggia, an expert on Church news. Scot asked Fr. Matt how The Good Catholic Life has affected his outreach to the events he organizes through his office, Office for the New Evangelization of Youth and Young Adults. Being able to excite the listeners about what’s happening: World Youth Day, March for Life, Hunger for Justice, and Eucharistic Congress, for example. It plants seeds and he hopes it inspires people. Fr. Matt noted that we’ve received emails from people who say the show has helped them come back to the Church. Scot said he often heard from people who said they were concerned about their grandkids’ generation, and these shows help people hear about the good things that this generation is doing. Susan and Fr. Matt talked about the Award Ceremony for the Office for the New Evangelization and all the great submissions they’ve received for awards. Scot said one of Rick’s favorite shows was our 100th show. Rick is the one who plans the shows and it was Joe Melendrez, the Rosary rapper. At first, they were unsure, but as soon as they heard it, they saw it was done in a respectful way and then they heard about his burrito ministry. He had won a burrito a day for one year and he eventually started inviting friends to come with him for lunch every day and he would talk about his life. Another of Rick’s favorites was Tom Craughwell, author of a book about some interesting and crazy stories in their lives. Of course, another of his favorites was episode #15, which had Rick’s mom, Maureen Heil, as a guest as well as Sr. Lisa, talking about the Pontifical Mission Societies and Sr. Lisa’s mission trips to Haiti and the Dominican Republic. Sr. Lisa was funny, sarcastic, bombastic and a lot of fun to listen to. One of Scot’s favorites was his interview of Jim Stenson, who has done a lot of talking about being a Catholic dad and raising Catholic children. That was our Father’s Day show. It’s a joy to interview people we’ve been fans of for so long. Fr. Chip said he’d been interviewed by Lino Rulli before, but meeting him in person was special. Fr. Chip said he also especially enjoyed the two shows interviewing Artie Boyle, who works in the Pastoral Center, who had been healed of a terminal illness after visiting Medjugorje. Scot said it was originally supposed to be one hour, but it was so good that they spontaneously recorded a second hour. Fr. Matt said the story is well worth going into the archives to listen to again. Scot mentioned other guests from the youth ministry area, like Bob Rice. Fr. Matt said last year they had Bob Rice come speak at an event. He’s a professor of catechesis at Franciscan University of Steubenville, a gifted musician, and a speaker in demand all over. Susan said Bob was an amazing speaker and she often refers rot the notes she took that day. Fr. Matt said we’ve also had Randy Rause from Life Teen as well, and it’s wonderful to have these people you look up to come and share their stories. Scot said Susan’s cross is she has to put up with two Landrys on Thursdays. She said it’s lovely to see the interview, but she said (jokingly), that he can be very fresh to Scot. 3rd segment: Talking about how the show gets made and some of the technical details and statistics. after 253 shows and 278 shows we’re not rookies anymore.